Help with research, writing, citing, and more! Your main source for detailed demographic data of the readers of many Canadian magazines and newspapers. See this page for the list of the magazines and newspapers currently covered by Vividata. Learn-by-doing! Try the sample questions in the Practice section of our Introduction to Vividata guide. Many (but not all!) magazines and newspapers will offer a media kit with details on their circulation, ad rates, and readers (demographics). Search for your target magazine's site and look for links to Advertisers or Media Kits. For example, see this group of kits for Quebecor Media Group magazines (includes Elle Canada and The Hockey News, among others). Or how about this page of resources about Globe magazines (e.g., Report on Business)? Also see this more detailed kit from Zoomer Magazine . Provides advertising rates and related data (e.g., circulation numbers) for every significant medium in Canada. It covers magazines, newspapers, radio and television stations and other advertising media -- although ad cost data isn't always available for every media outlet. CARD does not provide demographic details on readers/viewers. This annual publication includes detailed information on the Canadian market for a variety of media: everything from the age breakdown of the viewers of different TV channels to circulation, page rates, and readership of many magazines. Check the sites of TV broadcasters in case there is a TV version of a Media Kit (e.g., this page on the nature of CBC TV viewers). Check the Media Digest (listed above) for some broad demographics. Try to infer likely target audiences from the nature of specific shows and the types of ads they carry (but note that this approach may not be acceptable for your assignment). Online access to detailed Canadian consumer data at the brand level. Do you need to know the demographics of Canadians who are members of Aeroplan or who drink Red Bull? Start with the Vividata reports! Data on consumers and consumption around the world. Start by reading the Consumer Lifestyles in Canada report for a solid summary of Canadian consumers (ages, schooling, income, major buying habits, etc.). Also look for reports on the brand/company/product type. Note, though, that Passport does not provide the same level of demographic detail for consumers of specific brands that the Vividata reports contain. Includes industry publications (e.g., Automotive Industries) and advertising publications (e.g., Advertising Age and Campaign) that report on consumer trends, company/brand news, and specific ad campaigns. Reports (with methodology and data tables in most cases) on consumer preferences and opinions. Strong Canadian focus, but very random regarding the specific products or services covered. Be sure to scroll to the bottom of each summary to look for Detailed Tables. 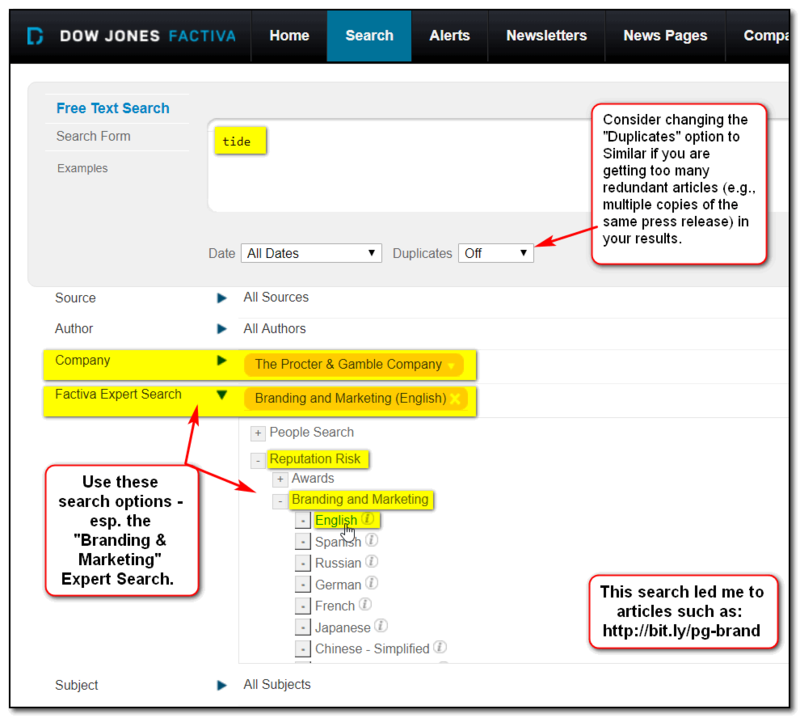 This news database has a special "expert search" feature that will help you focus on news stories about branding or marketing issues experienced by specific companies. See this annotated screen capture for help. Reports on 270 different brands, each of which covers “how a product originated and was first marketed, how it developed commercially and how it fares today compared with its competitors and its own past history.” These reports are unlikely to address the specific campaign you are analyzing, but they may provide some valuable background. Reports on major campaigns of the past: Who were the marketers trying to target? How did they do it? How successful were they? Also see the older publication: Encyclopedia of Major Marketing Campaigns. Possibly useful for context on your target brand or product type, but note that all campaigns discussed are from 2013 or earlier. Many books about branding contain detailed case studies of real branding situations (good and bad). Also try this broad search for articles that contain branding case studies. This online collection of brief company histories provides key strategic milestones in the development of many major companies/brands. See, for instance, this history of KFC and this one of Coca-Cola. See the Companies, brands, and products section above for resources to help understand the context and issues of specific brands. You will definitely need to find scholarly literature on your topic for your essay and your presentation. For a review of what scholarly literature means, start with: What is a Scholarly Journal? Note that many databases have a feature that allows you to limit your results to scholarly/peer reviewed journals. Using this will remove most of the non-scholarly articles from your results, but not all of them. You still need to evaluate each article to be sure that it is truly scholarly. Different databases provide access to journals in different subject areas. For your assignments, try searching in Business Source Complete and PsycInfo. Feeling inefficient when you search the databases? Spend a few minutes watching this video to save hours of searching: Only 4 Steps: Researching in Academic Business Journals (note that the Library website has changed since this video was made). Having difficulty reading the dense articles in such journals? Check out the resources in our Baffled by dense academic writing? Start here! blog post. Below are some common "consumer behaviour" subject headings used in each database to get you started. Books sometimes have a reputation of containing old information, but a quick subject heading search for "consumer behavior" in the SFU Library catalogue will find dozens of useful books and ebooks, many of which were written in the last few years. In addition, remember that consumers are people and human nature doesn't change much in the short term: older books aren't necessarily outdated! A good book can give you a broad overview of your topic: a single source listing the key subtopics, issues, and relevant articles you need to start exploring. Be careful to evaluate the information you find in books. In particular, always ask where the information has come from: was it from the author's own experience, a detailed study, or a range of studies listed in a bibliography? Would you trust the information you found if you had to use it to make a million-dollar decision? Start by searching with the following subjects in the SFU Library catalogue, but also try keyword searching to find books with just one chapter on your topic. For instance, the book "The Cambridge handbook of consumer psychology" has chapters on a number of key themes in consumer behaviour research, each of which could be an entry point into that part of the field. Similarly, see "The Routledge companion to consumer behavior analysis." You will be researching, evaluating, citing, writing, and presenting information from the moment your instructor gives you an assignment to the day you hand it in. We have information and experts available in the library to help with all of those steps... and much more! Start by checking to see if we have online tutorials & guides or workshops that will answer your questions. If you don't find what you need there, drop in (or book a time) at our research help desks or contact the library via online via chat, email or phone. Presentations: SFU Library has many books and e-books on “business presentations” and “public speaking.” Start with this guide to such resources. The Library also loans digital projectors you could borrow to use within the library and offers bookable meeting rooms in which you could practice. Literature Reviews: The literature review guides from the Student Learning Commons will be particularly useful for this course. See also this detailed infographic. I always try to reply to emails within two business days. However, sometimes that reply will be a series of clarifying questions or a suggestion that we book an in-person meeting to discuss complex topics. Don't wait to the last minute to start discussing your research!